CINCINNATI, OH (September 14, 2015) – The CARSTAR Cincinnati Business group hosted their annual golf outing at TPC River’s Bend on Monday, August 31, with proceeds benefiting the Fisher House Foundation. This year’s event raised a total of $12,000 through golf entry fees and major sponsors like Enterprise Car Rental and BASF. The CARSTAR Cincinnati Business Group golf outing is always an exceptionally patriotic event. The day kicked off with skydivers from Team Fastrax jumping in with the largest American flag flown by a skydiver at 7800 square feet. 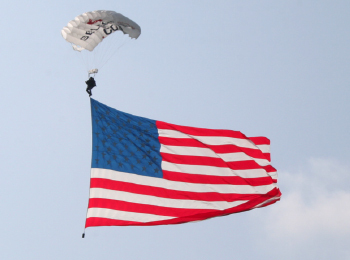 Once the flag opened during their descent, the National Anthem was played for everyone in attendance. As soon as the jumpers landed, there was a flyover by a P-51 Mustang, followed by a single bugle rendition of Taps. Two Gold Star Dads were invited as special guests. Gold Star Dads are fathers who have lost their sons or daughters at war. This year’s guests, John Prazinski and Jim Miller, both lost their sons fighting for our country. Prazinski said grace for the evening awards dinner, which was emceed by Dave Lapham, color analyst for the Cincinnati Bengals.